I am really addicted to new scientific approaches, progressive and unique, with the air of creativity, a tribute to philosophical aspects and ancient values. The Science to Sage E-Zine is a quintessence of it all and a lot more! This is a magazine about research and discoveries, modern achievements in science, the development of the Universe and the ancient heritage of humanity. It serves as an astonishing reservoir of knowledge on a great number of topics, which embrace a whole variety of information: from the roots of DNA and drone technologies - to the secrets of aether and the new water science. It miraculously combines global scientific innovations with spirituality and natural mysteries. ​Reading Science to Sage’s December issue I admired the tribute to Nikola Tesla on the first pages. I was really fascinated by the top 10 revolutionary inventions that were hidden from us and the Idea Emporium section was simply stunning! There was a lot of information on related seminars, sites and projects on the pages of this issue. All of them were interesting and useful to know about, but the most impressive among them was the Phoenix Voyage Project. It unites people and organizations from all over the world in their mighty effort to inspire every individual to make a contribution to the development of peace and safety on our planet. Phoenix Voyage’s message is startling in its simplicity: “Be the change you want to see in the world.” We should not forget our roots, we have to protect our home-planet for the sake of a safe future and we have all the possibilities to change this world for the better: science, arts, or philosophy - they are infinite. This project is an amazing initiative, which took its rightful place on the pages of the Science to Sage magazine! 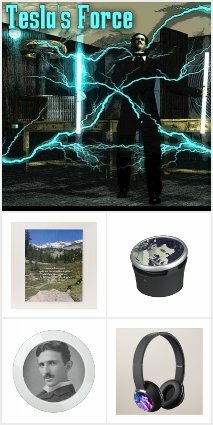 It is time to shop for the holidays and our team at Phoenix Voyage invite you to consider some cool items available at our Zazzle store. Most of the time there are amazing discounts at Zazzle...so you can check different items to see what is on sale. This ornament with the white fox and positive message "Change starts with me and you" on the back is from our upcoming book series for beginner readers. The series features animals from different countries and teaches about geography, friendship and good moral values. One of our goals is to get the first book published which is why we are asking for your support in purchasing some items from our store this holiday season. We have lots and lots of awesome products to choose from! Perhaps a throw pillow or nautical phoenix bird wood panel? a phoenix bird stein or Tesla quote puzzle? 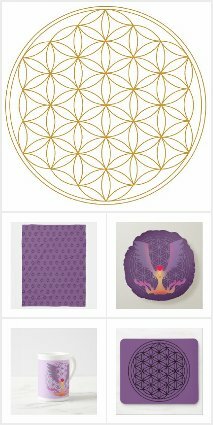 or how about Flower of Life throw pillow or body pillow? The positive message on our custom stamps will travel around the world spreading positive inspiration! We have an entire section with Nikola Tesla items too! ​Or cool Sacred Geometry gifts! 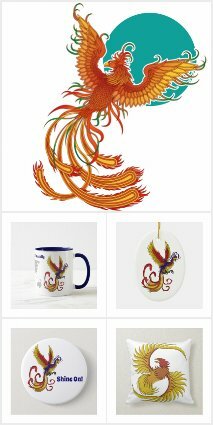 Our store is always adding new phoenix bird art so stop back to check out amazing creative expressions of the phoenix bird from various artists! Wishing you a happy holiday season from the Phoenix Voyage global family!